The City is focused on building the necessary social and physical infrastructure to support Toronto’s growth and maintain the City’s aging infrastructure in a state of good repair. 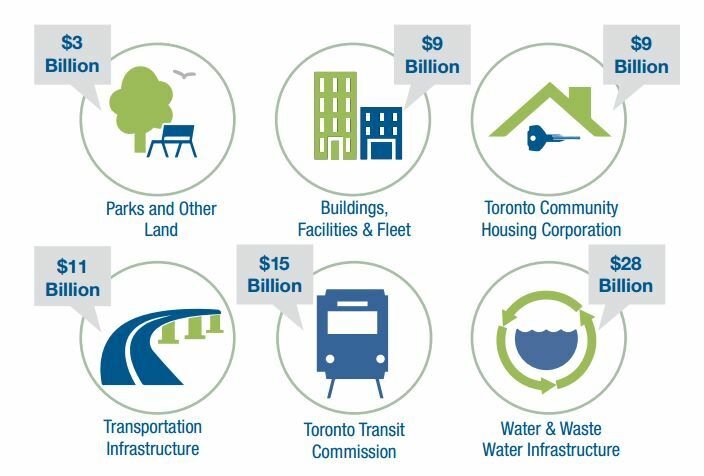 Toronto has over $75 Billion in existing infrastructure such as transit, roads, community centres, libraries, water and sewer facilities, parks and other things. The City’s assets support the many services that the City delivers. The capital budget funds the City’s assets that support service delivery. It is funded from reserves, development charges, other levels of government, and by borrowing funds or taking on debt. Toronto Water and Solid Waste Management Services are rate supported programs, the fees collected for the services also pay for the infrastructure to deliver it. Transportation and transit comprise of 74% of the City’s 10-year tax supported capital budget and plan. Nearly $14 Billion of this investment is to keep existing transit, roads and bridges running properly. The City had $33 Billion in approved capital projects in the 2016-2025 Capital Plan. Council has approved in principle or is considering an additional $29 billion in projects that remain unfunded. There is a limit to the amount of debt that the City can manage. The City’s has a policy that debt charges are limited to 15 per cent of property tax revenue. Toronto’s capital needs far exceed its current revenue sources. In order to provide sustainable funding for capital projects, the City will need to consider potential revenue options. Toronto currently has a dedicated property tax levy (1.6 per cent residential and 0.4 per cent non-residential) to help fund the Scarborough Subway extension. Beginning in 2017, Toronto will introduce include a special dedicated property tax levy for the City Building Fund for priority transit and housing capital projects. The City will also seek support from both the provincial and federal government for specific projects. The City holds a wide variety of land, corporate and other assets. Optimizing asset performance and disposing under-utilized assets may improve the City’s fiscal position. In the past, consideration has been given in terms of value and impact on future revenue and broader policy objectives. City Council has directed staff to explore which assets with commercial potential could be sold in part or total to the private sector to generate revenue. These assets include selling all or part of major land holdings, Toronto Hydro Corporation or the Toronto Parking Authority.